Mustard based barbeque sauce is a flavor that is associated with the Carolinas. We rarely experience mustard sauces at the judges table here on the west coast. We have sampled several brands in the past that have been just okay. I believe mustard is a wonderful flavor with pulled pork. I do love mustard and I also love chile peppers. 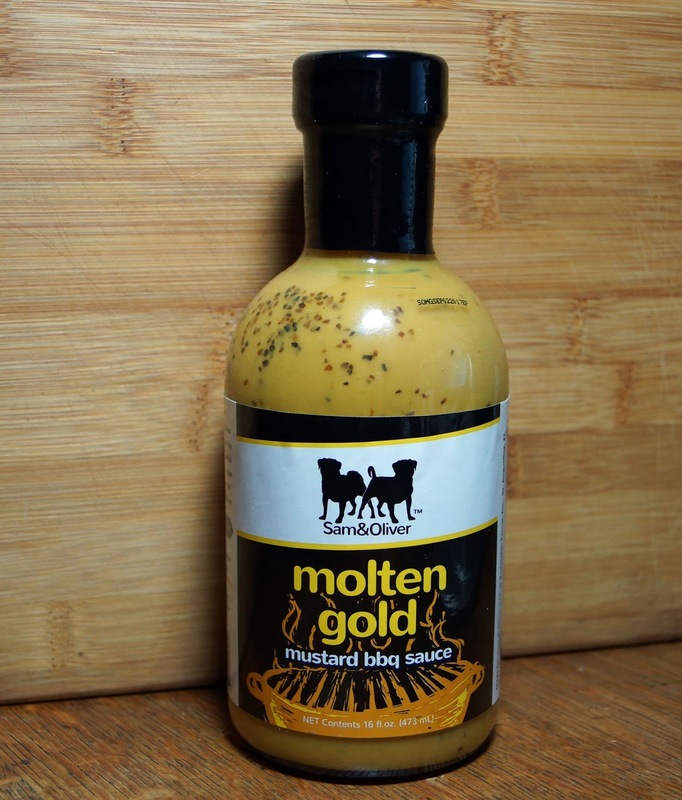 ‘Sam & Oliver’s Molten Gold’ a mustard based bbq sauce combines habanero peppers, mustard and a shopping cart full of ingredients to form their sauce. Let’s give it a try. We took a gander at the ingredient list below and found an ingredient that was very unusual for a bbq sauce; butternut squash. Yes, butternut squash. The sauce is mustard yellow in color. It is thick and fluid with an unidentified ingredient speckling throughout. The initial taste straight out of the bottle had a little pepper kick. This bite was from the habanero pepper. It was not a kick in the head but a gentle nudge. We found later, when used in cooking the pepper flavor and bite was perfectly warm The initial flavor burst was a welcoming sweet, savory mustard lover’s delight. The all important factor of balance of flavors was a winner. I still am a little puzzled on the butternut squash element because to this tester it was only a listed ingredient. We tried it on some barbequed chicken. It was offered at a football gathering. It was a hit. One football fan volunteered the information that this was the perfect heat. Molten Gold has rung the bell with mustard flavor and habanero warmth. We were very impressed with the balance of flavors combining to create a sweet and savory sauce. This sauce is a smidgen over mild and can be served to the pepper challenged crowd. We are now big fans of Molten Gold and hope to purchase in the future. I cannot wait to try this with some pulled pork. I love a good mustard sauce. Especially on wings. Have you ever tried Wee Willy's South Carolina Gold barbecue sauce? It was my first mustard based bbq sauce and I love it! Buzz, We would love to do a BBQ tour of Texas. That is on our bucket list. Three Dogs BBQ, I am warming up to mustard bbq sauce. It still is a new arena for us. Jon Jakoblich, I have not. I definitely will have my eye out for Wee Willy's sauce. Thanks for recommendation.